The story takes place in Edo Castle in 1656. Foreign-style painter Yuan Yamada is asked by the young shogun Ietsuna Tokugawa to tell him the truth about the rebellion in the Bizen Shimabara domain 20 years ago. Yuan begins to tell the story of Tokisada (Shiro) Amakusa, the man who stood up for the people and became venerated as a messiah. The year is 1637, people in the land of Amakusa in Kyushu, once ruled by Christian feudal lord Yukinaga Konishi, still hold tight to their faith in Deus even after the ban on Christianity. The situation is the same in Shimabara, across the sea from Amakusa. People strive to live their difficult life burdened by heavy land taxes and plagued by famine, believing in “paraiso,” the heavenly land taught by Christianity. On Easter Day, in the aftermath of days of severe storm, a mysterious man drifts up on the shore of Oyanojima, Amakusa. Even when Kosaemon Watanabe, a surviving retainer of the late Lord Yukinaga, visits to check on the man, he keeps his mouth shut, not saying a word, let alone mentioning his own name. Kosaemon asks his wife’s father, Jinbei Masuda, to take care of him for a while, a request Jinbei willingly accepts, and gives the man the name Shiro (“fourth child”), taking him in as his fourth child. As Shiro lives among the poor but emotionally generous people of Amakusa, he develops an interest in their faith. One day on the beach, Shiro comes across his former shipmates, Fudomaru and Tamonmaru. It so happened that Shiro had been the head of a wako (Japanese pirate) band under the name of Yashaomaru. While looting treasures far and wide across the ocean, Yashaomaru and his crew had been caught in a storm in the East China Sea that shipwrecked them, but they miraculously drifted to this land. The three rejoice in their reunion. However, Fudomaru and Tamonmaru insist on searching for the Portuguese treasure hidden in this land. While Shiro tries to talk them out of it, explaining that there is no such thing, his curiosity gets the better of him, and he comes to believe there may be a secret on the deserted island of Yushima, located between Amakusa and the Shimabara Peninsula, and the three head for the island. Shiro and the two set foot on Yushima and discover countless portraits of saints in the depths of a cave there. They were works by Emosaku Yamada (later Yuan), a young man from Shimabara with the baptized name Reno, hidden away from people’s eyes. Reno grabs his katana, declaring that now that they have seen the banned paintings he cannot let them leave alive. Then, Ru, a beautiful woman who was modeling for Reno as the Virgin Mary, stops him. Ru and the saints Reno had been painting exerted a strange pull on Shiro and remained firmly lodged in his mind even after he left the cave. A few days later, when Shiro visits the cave again, he has a chance to talk with Ru alone. Shiro gradually develops feelings for the innocent Ru. Sometime later, Reno hurries back from Shimabara bearing alarming news: Katsuie Matsukura, the lord of the Shimabara domain, has ordered Ru’s brother Gennojo Matsushima to bring his sister to serve him at the castle. The domain lord had laid eyes on Ru’s beauty and had asked for Ru in exchange for easing the levy of land tax on Gennojo, who had remonstrated the lord for his insufferable tyranny. If Ru goes to Katsuie, known for his ruthless treatment of people, the predicament she will face is not hard to imagine. The samurais of the Shimabara domain find out about the cave and launch an attack. Shiro and his fellows fight them off and head toward Amakusa. 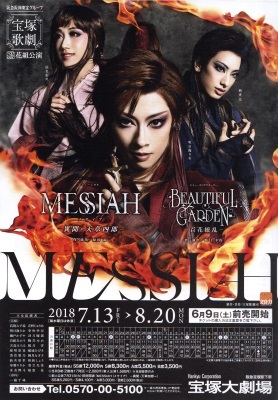 A profusion of beautiful, talented women† — an eternal flower garden with blooms of various scents and colors — Takarazuka. In its midst is a particularly beautiful, grand, and lively bloom — Asumi Rio. She leads Flower Troupe, a treasure trove of peerless beauties. Filled with Flower charm, the Beautiful Flower Man (Hanaotoko) is entranced by the elegance of the Beautiful Flower Woman (Hanaotome), whose heart races from the allure of the Hanaotoko. A gorgeous, magnificent revue production with an adult atmosphere. Like the lovely, fragrant, beautiful flowers that bloom in the field; like the passionate, intense, bewitching, and vivid fireworks that bloom in the night sky! Scenes of lovers connected to the theme of flowers — their dreams, loves, and romances — famous songs from many times and places — numerous beautiful costumes — please look forward to this dazzling entertainment show. † 百花繚乱 means both 'a profusion of flowers' and 'a profusion of beautiful / talented people'. Final performance for Tenma Michiru, Niina Kaho, and Ouma Shion. Flower Troupe performed a musical based on the events of this time period in 1972 called Amakusanada of the Flame. Created by lokai. Last Modification: Monday 25 of February, 2019 05:16:31 PST by caithion.